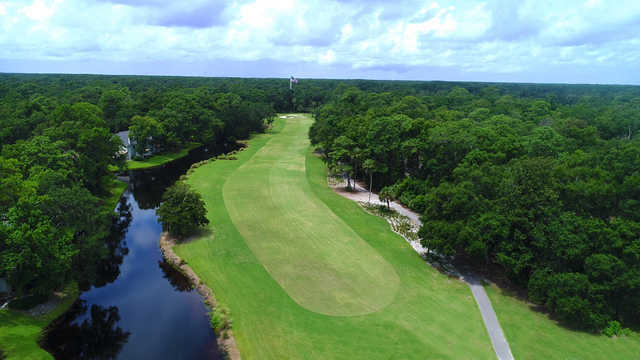 The Galleon/Brigantine Course at Shipyard Golf Club combines two of the three nine-hole golf courses at the club. Galleon/Brigantine has a rating of 72.7, with a slope of 133 from the championship tees. The original nine holes - Galleon - meander through large oak and tall pines. Accurate placement of approach shots into heavily guarded greens is necessary on this nine. Designed by Willard Byrd and built in 1982, alligators sun themselves along the scenic, water hazard-filled Brigantine nine holes. With slight doglegs and well-placed bunkers, this golf course requires shot making and a good short game.